Pets can easily become part of your family at home. When they die, it can hit us a much as a person’s death would. For a young child, the death of a fish might be detrimental to them because it is the first experience of death. However, rituals to help the child cope with the death of a fish are not as extensive as a person’s death. They usually just involve flushing the fish down the toilet while saying a few words about how meaningful the fish’s life was. But as the involvement and length of the life of the pet increases, such as with a cat or dog, the death rituals also increase. The death of a cat or dog also comes at a later age. 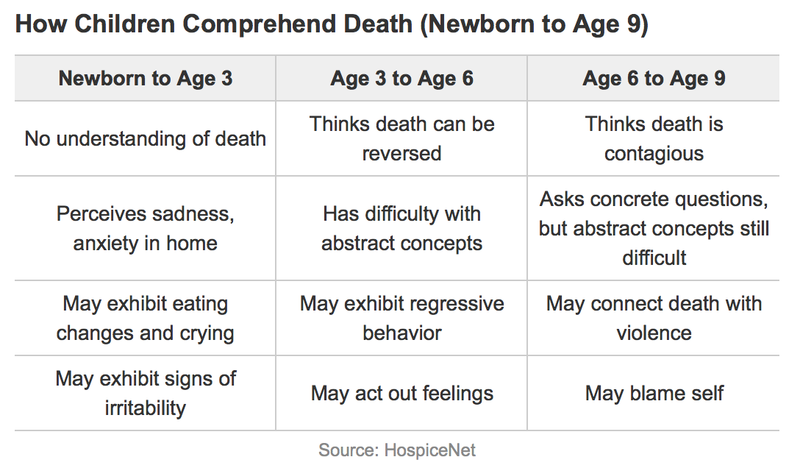 I found this chart in an article about how to talk to your child about the death of a fish. 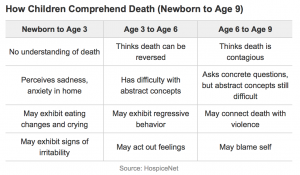 It shows us that a child is able to better grasp the idea of death as they grow older. With the better grasp comes more elaborate rituals for some. You often have the option to cremate your pet and keep their ashes in an urn. My cousins have a shelf in their living room called the “dead pet shelf”. This isn’t uncommon in households where pets are considered part of the family, but anything more than this, such as a funeral, is unusual. Even though they are unusual, pet funerals do happen. Not far from Emory, the Shugart Family owns Deceased Pet Care, which offers burial and funeral services for pets, including horses. Because these deaths mean so much to some people, they are willing to pay and involve others in the funerals for their pets. They buy caskets and bury their furry friend in a garden. How far are you willing to go for your pet and where would you draw the line? Each day, unbelievable amounts of human energy are channeled into prolonging life. We pour millions of dollars and unending hours into seeking medial advents that may fend off death, not only for people who face an immediate risk of dying, but for humanity at large. Prolonging, extending, and improving life in the face of death is the paramount pursuit of humanity. The concept of immortality has intrigued civilization for ages. Starting with the earliest recorded societies in which immortality often served as the delineating characteristic of gods from men, humans have always elevated and pursued immortality. For most of human history, such aspirations have been just that: aspirational. But as technology advances rapidly and human society achieves unthinkable technological and medical feats such as resuscitation, we may be closer than ever to truly finding immortality. While there may no immediate indicator that immortality is at our fingertips, given the rate of scientific progress in the twenty-first century, the advent of extreme life-prolonging technology should not come as a surprise should it occur. However, while immortality in the abstract may seem to be the ultimate achievement, most of us don’t want it. According to a recent study by the Pew Research Center, over 60% of Americans wouldn’t want to live past 90 years old, and another 30% hope to never make it past 80. 51% of adults also indicated that not only would they not want to extend their own live, but also felt that life-extending technology would be net-bad for society. Commonly cited concerns include inequity in the distribution off life-extending technology and an accompanying exacerbation of unjust resource allocation, fear of bearing witness to more deaths and losses as a result of having more time to live, and the potential of just being bored. Regardless of reason, a majority of Americans have no interest in extending the duration of human length. While there are many ethical and practical concerns that come along with the possibility of life extension and even eventual immortality, such concerns may require immediate and pressing discussion. Scientists now estimate that some newly-born children will live to be well beyond one-hundred, and with such imminent possibilities, it is critical that our society start tackling questions of how to address extended life head on. Particularly as current rates of resource consumption threaten even the possibility of stable population management and preservation, accommodating longer lifespans may threaten the population at large by expediting resource depletion. Moreover, in America, healthcare for the elderly is already in a state of financial and organization disarray, covering too few and being stretched too thinly. If living longer forces people into living in deteriorating states for longer, medical budgets will undoubtedly be tested. While life-saving and prolonging technologies have consistently proven to be some of the most incredible inventions, such technologies may one day outpace our social and moral frameworks that must accommodate them. In order to prevent that from occurring, scientists and ethicists should bring discussions of life extension into the public realm so we can all begin to consider the prospects of longer or even immortal life and whom/what it might be good for. I recently visited the Bodies exhibit at Atlantic Station which features anatomical presentations of preserved human corpses. They kind of ease you in. The exhibit opens tamely with a segmented human skull in a plexiglass box. The next room has a skeleton and a series of other bones. That’s when I turned, after staring at a few pieces of vertebrae, to see a cadaver with the skin peeled away; skeletal muscle fully exposed, gripping a basketball in an athletic stance, staring back. Something about knowing it was real, that this had once been a living person, made it different than any previous attempt to teach me anatomy. I was shocked and honestly a little scared. I had to force myself to come closer, some part of me fully expecting him to burst into violent life. It’s strange, but I think it may be the first time I’d seen a human corpse in person. It took a moment for my morbid fascination to make room for scientific curiosity, but something about the combination of those two feelings formulated the sensation of awe. It was almost as if I felt obligated to look closely, as a matter of respect, to the people who provided their bodies. It was incredible to look at the intricate musculature laid bare before me and know that something similar and just as complex was inside me, taken utterly for granted. Natural selection simply hadn’t required that degree of self awareness. As we continued through the exhibit a friend of mine repeated several times that he would like to donate his body to something like this when he dies. When I pressed him further he said it was appealing to be useful even after he died, to be a part of someone else’s learning, but he also alluded to the desire to be preserved so thoroughly. Wanting to be preserved after death had never exactly made sense to me. I’d always seen it, frankly, as clinging to an existence that has certainly fled through an arrangement of matter you happen to identify with. Considering this again, while standing in front of another corpse presented as art indicated an alternative motivation. The human body is simply beautiful and while I still don’t personally care if I am preserved, I understand why someone might think it a shame to let themselves rot. I think that beauty is seated in the functional complexity of the body and staring fascinated at humble displays of the nervous and circulatory systems I had moments near worship. I study biology, but this reminded me why. Imagining or viewing an image of the human anatomy pales in comparison to the visceral understanding of seeing the real thing, knowing every nerve and artery was meticulously divorced from the surrounding flesh. Equally striking and immeasurably more disturbing was the exhibit on development. Separated by a wall of curtains and caked in thorough disclaimers lay a series of plexiglass cylinders illustrating the progression by weeks of embryo to infant. Another friend couldn’t help herself from blurting out something about magic every few seconds and I couldn’t blame her. To me it was strange how soon we started looking like a person, it quickly became apparent how politicized the issue of abortion has become. I had more or less unthinkingly supported the doctrine of “pro-choice” without having any real understanding of what a fetus even looked like. I wouldn’t say I altered my stance, but looking at a twenty-week-old fetus the issue suddenly seemed more ethically charged than it had a moment before. The exhibit closed with a cadaver posed to be waving goodbye and a statement to the effect that it’s easy to go about our daily life, but critical to take time to ponder our origins. In fact, I found my mind making subtle adjustments to mental models. Organs I would have imagined to be bigger were smaller, structures I would have thought to be simpler were more intricate. Everything varied slightly, nothing was the same. Scientifically inclined or not I fell victim to subtle inaccuracy and assumption. More abstractly, we’ve designed a standardized system of education based on imperfect idealized models of reality and assumed that this is somehow more effective or efficient than tangible experience. I think we all have a fragment of faulty understanding that we can only correct by personally examining reality. But please — don’t take my word for it. Three days ago, a massive terrorist attack took place in various locations in Paris, France. About 130 were killed and roughly 350 were injured. The entire world had something to say about this, and everyone with a working Internet connection heard. Within hours of the attack, my entire Facebook and Instagram newsfeeds were flooded with pictures and comments regarding the event. My friends and acquaintances spoke of their solidarity with France; about how today (referring to the day after the attack) “we all are French”; most of them even changed their profile pictures to have a filter of the French flag so as to demonstrate their support for the French people. Even President Obama released a statement on the night of the attack where he expressed his outrage and pledged his and the American people’s alliance to the French people. Just one day before the events in Paris took place, a massive terrorist attack was staged in Beirut, Lebanon leaving 43 dead and 250 injured. The morning of the Paris attacks, 18 were left dead and 41 were left injured after a suicide bomber blew himself up in Baghdad, Iraq. Either the world was literally left speechless as a result of these two occurrences, or the events simply were not important enough to publicize all over news and social media. It is needless to say that the latter was the case. I speak for myself as well as many others when I say that I knew absolutely nothing about these attacks, despite how horrendous they were. In fact, it was not until after the Paris incidents that I heard of the Beirut and Baghdad attacks. So what are we seeing here? Well simply put: when a western country or western civilization is threatened, we interpret those threats as strikes towards our own values and towards ourselves; we thus raise up our voices and vow to stand in the way of any harm that may come to our culture and the people who make it up. However, when an attack falls upon the other cultures of the world, we see an attack on something that is not our own, and so we remain silent. But why? Is this because other cultures are less important or less worthy than our culture? And if so, then what makes our culture so worthy of our fight and solidarity and what is it that makes other cultures undeserving of these efforts? These terrorist attacks are but a small window into the problems of this world and the role that western supremacy has taken in the lives of the American people. Yes, I pray for Paris and mourn the victims of the Parisian attacks, but I also pray for Beirut and for Baghdad, whose victims, much like the Parisians, did not deserve such a fate. Two weeks ago, I discovered this really touching Upworthy blog on social media about grief: http://www.upworthy.com/magic-words-to-say-when-everythings-going-wrong-not-everything-happens-for-a-reason. The author of this blog has something really powerful to say. I think these words are especially pertinent to anyone who has ever tried to give solace or facilitate the grieving process for someone else. So what’s the solution? We often offer platitudes because we don’t know what else to say. Well, according to the author, the solution is simple. We must simply acknowledge. The most powerful thing we can do is to say is, “I acknowledge your pain. I’m here with you” and say nothing more. The key here is to say you’re there “with” someone instead of “for” them. Saying that you are there “for” them implies that you are going to do something to fix the situation which is not your place at all. However, standing “with” them in that zone of vulnerability, discomfort, and disbelief can be incredibly empowering. By now most people have seen the news that Friday night there was a terror attack in Paris. I can only imagine what the people of France and specifically are feeling this morning. This morning when I signed onto my social media accounts I notices a few things that people were posting about the attacks, “stand with paris,” “Paris is in our prays”, and interestingly enough I saw post that related to how Paris, France reacted to 9/11 and how we should show the same support they showed us. I then when onto the New York Time website and in enlarged letters stays, “Hollande-Blames ISIS for ‘Act of War’ on Paris”. The article talks about how the president of France is taking on the situation. 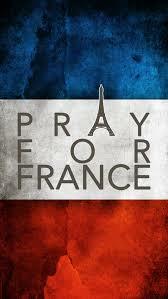 France has gone into a three day grieving period. According to the New York Times article, they are almost certain that ISIS an Islamic extremist group is behind the attacks. Hollande states that they are prepared to begin fighting if necessary within the guidelines of the law. I am sure as the next few days pass there will be more evidence and information revealed about the attacks but for now it is a time of reflection and mourning for the people involved. Currently it is believed that 127 people are dead and more than 200 people have been hospitalized. In class we have discussed the idea that we have ritualized death as a way of grieving and it allows us to find a way to move on. Do we have a ritual for death when it comes to terror attacks. In the post 9/11 world the term terror attacks has been used mainly to describe an attack made by extremist groups on certain countries. The United States especially New Yorkers, I being one of them remember quiet well that day when all things changed in New York. How do people grieve the deaths of innocent individuals killed in such attacks? Does the pain ever go away? I personally have never first hand experience a death due to a terror attack or suspected terror attack so I couldn’t answer those questions. But as the world becomes a more dangerous place I think it is important for ritual to be implemented to allow family and friends to grieve these losses in a way that is health and respectful. I could only imagine how difficult it may be to grieve a person whose body may not even be recoverable. Similar to that of a solider who dies in combat and the only thing that can be found of theirs is the dog tags. Paris is in our hearts and prayers during their time of need. This is just one example of what people have been posting throughout social media since the attack occurred. I was watching the movie Capote last night and it got me thinking about death row and the psychological health of the inmates. Capote follows Truman Capote’s process in writing the non-fiction book In Cold Blood. Capote interviews one of the murderers who killed four members of the Clutter family. After spending innumerable hours interviewing the murderer, Perry Smith, Capote becomes attached because of his remorse and emotional sincerity. Smith’s appeal process lasts several years and at the end of the movie he is finally executed. The book and the movie are, to be concise, sad. Death row is absolutely terrifying. When it is put in context of a sympathetic character who you can relate to, even with his violent crimes, the death penalty feels wrong. I think the actual time spent on death row is just as frightening as the actual death itself. Imagine being told you are going to die in a week. Imagine preparing to be put to death. Then, imagine being saved (for the time being) from a delay of execution and starting the wait again. On top of waiting for imminent death, inmates live in horrible conditions. Cells are small, some are tiny- about the size of a parking spot. Some have multiple inmates inside, others are solitary. Inmates don’t leave their cell, and frequently their only human contact is their legal representatives. They cannot participate in prison employment and educational programs and their visitation and exercise is restricted. These conditions would be incredibly difficult to endure for just a day or a week, but inmates on death row frequently have to live in these conditions for years. Other countries have passed laws limiting the amount of time a person can be on death row, though the United States Supreme Court has not yet done so. Inmates on death row in the U.S. typically spend at least a decade waiting for their execution. Some have been on death row for more than twenty years.The average time between sentencing and execution was 74 months in 1984, and in 2012 had increased to 190 months. The death row phenomenon describes the effects that time on death row has on a person, including the physical effects and the mental. Death Row Syndrome describes the psychological illness that occurs because of the death row phenomenon. Inmates react to these conditions in different ways. Some become delusional, some sleep almost the entire day, others attempt suicide and others choose legal suicide, in other words they give up on appealing their conviction. In 1989, a German named Jens Söering murdered his girlfriend’s parents in Virginia. He fled to the United Kingdom where he was then caught. Söering’s lawyers argued to the European Court of Human Rights that the conditions on Virginia’s death row were so severe and the delays were so long that it would be “inhuman or degrading treatment.” He was extradited after the prosecutor promised not to seek the death penalty. Sometimes I forget the death penalty exits, or I try to push the fact to the back of my mind because it is so disturbing to me. Once an anti-death penalty organization gave me a flier that stated the names and exact execution times of those on death row and it was SO disturbing. Is being executed considered a bad death? I would think so. One of my favorite aspects of my study abroad experience in Spain last spring was learning about the recent history of the country, mostly pertaining to Franco’s rule. Many Americans are not taught this history in school and I had little to no knowledge of Franco before I arrived in Spain. Francisco Franco or “el Generalissimo” was head of state for Spain from the late 1930s until he died in 1975. He assumed power after the civil war in the 1930s between the Republicans and the Nationalists (a sect of fascism). Being a military man that fought for Spain in North Africa, he ruled the country with strict rules and regulations. Soon, his rule turned into a dictatorship. Franco’s nationalists were supported by Hitler and Mussolini, which demonstrates the oppression found in the country at the time of the civil war and at the early points of Franco’s reign. The country was closed off to the rest of the world for many years until a tourism boom in the 1950s exposed the country to the other European countries and even the U.S. 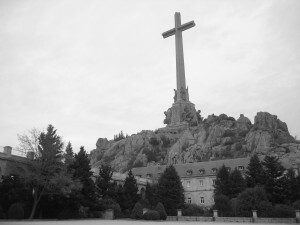 The oppression and violence Franco used during his rule has had everlasting effects on the Spanish population, which is why his burial and gravesite continue to be so controversial. With this quick background knowledge, I imagine you can believe that Franco is a sore spot in history for many of the Spanish. It seems unlikely that his grave would turn into a tourist site right? Well that is the opposite of the case. 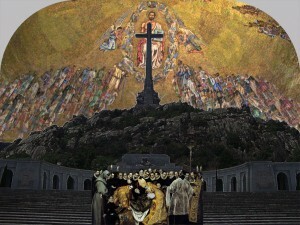 His funeral and open casket drew huge numbers of people to the cathedral in Madrid. Many people can be seen crying in the news coverage. Another large part of the population that attended his funeral were there to show their hatred and disdain for the dictator. While Franco was still alive, he had Republican prisoners start building his memorial site right outside of Madrid. 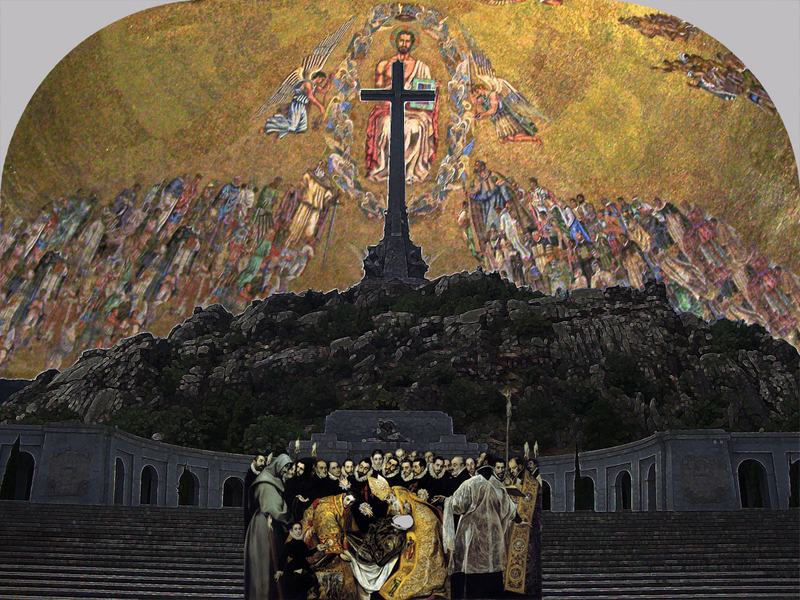 He purposely chose the spot he did because it is close to the resting places of the Spanish kings at El Escorial. The building is massive. When driving between Madrid and Northwest Spain, you can easily see the Valley of the Fallen from the highway. 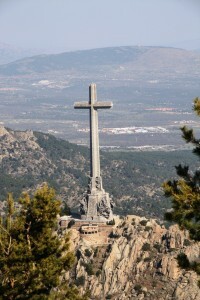 It has a towering cross and a huge mausoleum complex buried in the hill. As I have heard, after Franco’s death and burial the monument was spun to represent the fallen during the Spanish Civil War. The building is extremely controversial and the Spanish are not sure what to do with the monument. Do you allow a building to continue to stand that symbolizes so much oppression? Is it possible to repurpose this gravesite to mean something else? Spain has an intriguing law, la ley de la memoria, that has condemned Franco’s rule and has mandated that all street names and other references to Franco be changed. I believe it is difficult to change this monument because it pertains to death and may disrespect the dead if there are any changes to the monument. The law also prohibits political events to take place at the site of Franco’s grave. This demonstrates that there still are tensions in the community due to the dictatorship and the sight of the grave of a controversial leader can reignite these fractures in society. Because the Valley of the Fallen houses many other victims of the Civil War, it is almost impossible to know how to approach this issue without hurting the individuals involved. Franco’s grave presents an example of how even after someone dies, their influence can continue and can be perpetuated by how they were buried. One of the most controversial attractions to have entered and taken root in Atlanta is the BODIES Exhibition. A science based exhibit, the museum of sorts has numerous real human bodies in various poses on display while other sections analyze specific parts or components of the human body and systems such as the brain. Aside from the arguments surrounding the acquirement of the bodies themselves, many drew conflict with the concept of placing someone’s remains on public display. Those arguments have diminished over the years as the angle of the exhibit is pushed to encourage scientific learning and medical education for all levels. BODIES, however, is certainly not the first (or likely last) tourist attraction that has used the human corpse as a means of revenue. Looking at an earlier, less ominous example brings us to the amusement park Disneyland. Built in the mid-60s, the popular ride attraction “Pirates of the Caribbean” draws in numbers of park visitors. Sitting in a boat, visitors are taken through a bayou-like environment passing many ‘piratical’ scenes. Use of sculptures, audio effects, and animatronics, all bring the pirates and their rambunctious natures alive for guests. Our society today tries to achieve realism in games, films, and other media forms in order to enrapture the viewer in an experience. This same drive was present back in 1967 when Walt Disney and his team of Imagineers (Disney imagine engineers) created the attraction. After having spent so much time and money on the rest of the attraction in terms of props and wardrobes, the fake skeletons of the time paled in comparison to the rest of the environment’s realism. The inclusion of fake, full skeletons and skull cross and bones throughout the ride did not fit and by general consent, the team agreed to put in real human remains in their place. Taking remains from the UCLA Medical Center’s anatomy department, the Disney Imagineers placed skeletons throughout and profited from the parks’ visitors who essentially entered a highly decorated morgue, likely not knowing of the ‘props’ realism. 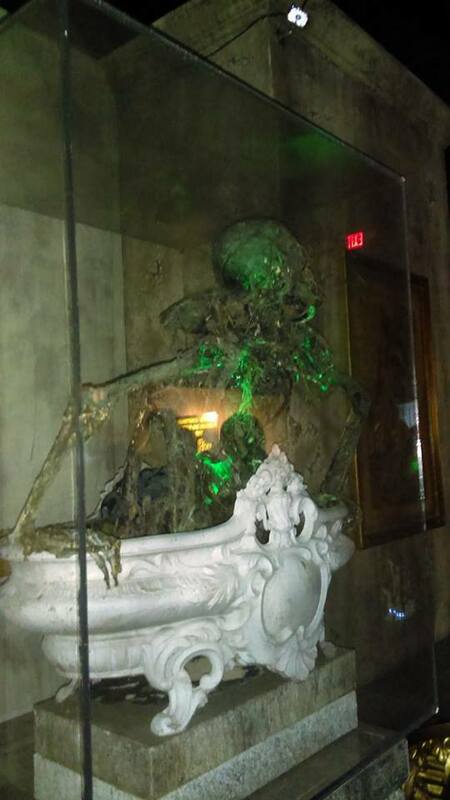 Disney claims they have fully removed the real human remains and replaced them with actual props (now more easily crafted to look realistic) but some viewers are still skeptical, leading to investigations of the ride. Analysis has shown a couple of skeletal remains were in fact still present in the ride and there are a few more that are still suspected. It’s surprising that once those pieces were found, they were not instantly removed and returned to their proper countries of origin and laid to rest in a proper burial as the others were. Granted, that claim also leads one to question how the remains were identified to belong to a certain country or family if they were previously donated from the medical center. Regardless of whether Disney has or has not removed all previously living skeletal remains, it’s still disturbing that one not only took the remains of humans who donated their bodies for science but instead put them in a children’s amusement park propped up to look like discarded pirates. At this point, it also does not matter if the bodies were properly returned because the damage is already done. Disney will continue to profit off of the real human remains and it’s lingering legacy as long as people continue to propagate the idea that there are still real skeletons among the fake in the Pirates of the Caribbean attraction. Last weekend, a friend and I went to the Netherword Haunted House event on Halloween. We went around 6pm, in hopes of avoiding large lines, but we still waited 40 minutes before entering the house. Some people were in costumes and most, like myself, were in casual attire with a terrified facial expression. It was my first and last time going inside a haunted house. In class we’ve discussed how funerary practices and mortuary services often require some financial contribution, which supports the idea that associating with the dead creates a profit. In regards to Halloween, stores are able to raise their prices of candy, costumes, and pumpkins, which further commercialize the holiday. According to various pieces of literature, Halloween is believed to be a time where the veil between the living and the dead is lifted. But the holiday can easily be associated with the fall season. Which is marked by the end of the harvest, leaves falling, and animals entering a state of hibernation, as we approach the “dead” of winter. Halloween serves as a holiday influenced by the event of death itself. Throughout the haunted house, there were many images and props of the “living dead.” There were also individuals in each corner wearing some form of costume that represented zombies and famous killers such as Michael Myers. I found it interesting how relaxed people seemed to be with such gruesome images of the dead. 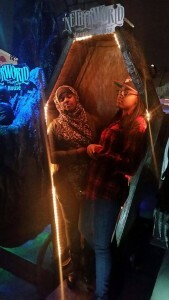 I was somewhat uncomfortable throughout the entire time, especially when I stepped inside the fake coffin. I felt as if I was mocking the dead. Is it ethical to make money off the dead and their image?